The aorta is the main artery carrying oxygen-rich blood from the heart to the body. After each heartbeat, the valve closes tightly to prevent blood from flowing backwards into the heart. 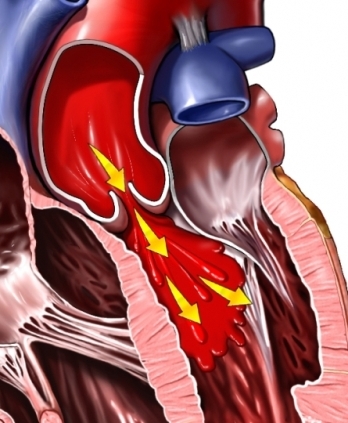 Aortic insufficiency occurs when the aortic valve does not close tightly enough. Sometimes the cause of aortic insufficiency is unknown. Treatment options depend on the severity and history of the valve leakage. It also depends on its effects on the heart’s size and function. Talk with your doctor about the best treatment plan for you. In chronic and slowly progressive aortic insufficiency, treatment may involve taking medication. Surgery is needed in severe cases. Depending on your condition, your doctor may schedule routine physical exams and echocardiograms. If the condition is rapidly declining, surgery is needed. There are several open heart surgeries that can fix leaking valves. The type chosen will depend on the valve and the knowledge of the surgeon. Aortic insufficiency may not be preventable. If you have a family history, talk with your doctor about screening tests. Aortic regurgitation. EBSCO DynaMed Plus website. Available at: http://www.dynamed.com/topics/dmp~AN~T113982/Aortic-regurgitation . Updated September 1, 2017. Accessed September 15, 2017. Coarctation of aorta. EBSCO DynaMed Plus website. Available at: http://www.dynamed.com/topics/dmp~AN~T116066/Coarctation-of-aorta . Updated June 16, 2017. Accessed September 15, 2017. Congenital heart defects. Kids Health—Nemours Foundation website. Available at: http://kidshealth.org/en/parents/congenital-heart-defects.html. Updated April 2015. Accessed September 15, 2017. Explore congenital heart defects. National Heart, Lung, and Blood Institute website. Available at: https://www.nhlbi.nih.gov/health/health-topics/topics/chd. Updated July 1, 2011. Accessed September 15, 2017. Problem: Aortic valve regurgitation. American Heart Association website. Available at: http://www.heart.org/HEARTORG/Conditions/More/HeartValveProblemsandDisease/Problem-Aortic-Valve-Regurgitation%5FUCM%5F450611%5FArticle.jsp#.WbvwebKGNxA. Updated September 7, 2017. Accessed September 15, 2017.